The State of Oregon, on the west coast of the United States. The state has been split into the counties that make it up, and some counties are in half because of their size. This is my first map, so feedback would be appreciated. Plays fine, but the territories seem to be just thrown into place without care. 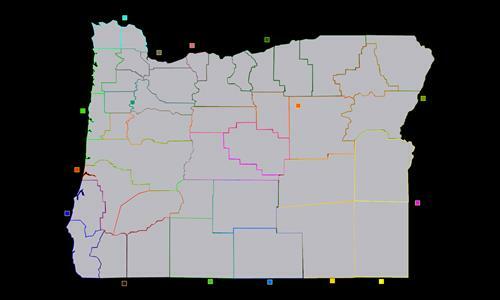 The territories are based off of Oregon's real counties. Honestly I'm not sure who came up with the shape of the counties here, but its just like that, and I made it into a map. So blame the government, I guess. Edit: now that I think about it I think you meant how I placed it. yeah, I'm kinda new to the map making thing. Review by Rear Admiral John on 4/6/2015. This is an awesome map that was made. I've enjoyed this a lot. Strategically, the best spot you can be in is the left southern corner of Oregon, and the worst spot is in the right northern corner of Oregon (based on how many armies per turn you get). Again, I must say a very awesome map. Thank you to the person who made it. Please make more maps so we can enjoy those as well.